I've commented on this in the past, but it's remarkable how much neglect a starter can go through and still be able to rise well after a few feeds. I fed my starter Friday morning, then Friday night and again Saturday morning. Admittedly I used my proofer box after the Saturday morning feed. It hadn't been fed in a few weeks. I used all the starter from the previous feeds to build up volume and had no discard. My first feed was 1:3:3 and went 12 hours, my second was the same and went for about 14 hours, my third was 1:2:3 and went for about 6 hours to a triple in volume. I ended up with about 330 grams of starter. 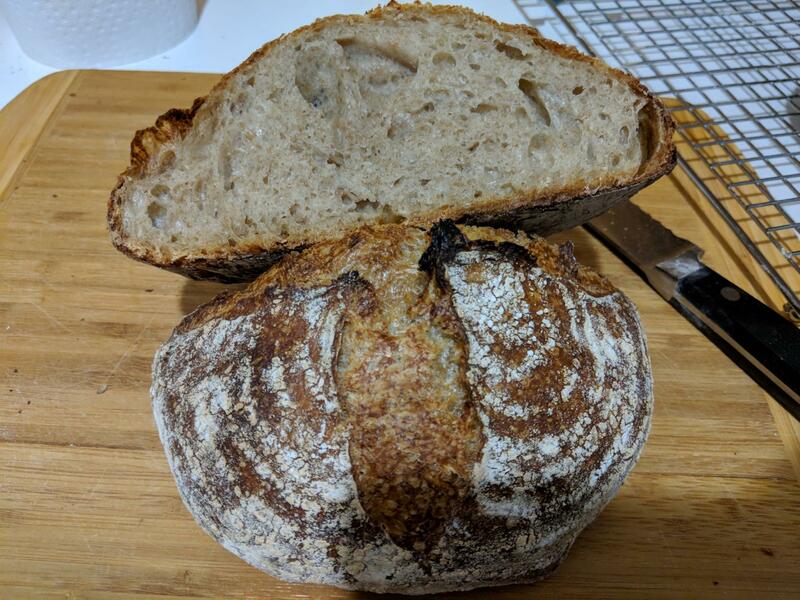 While not what I intended, I ended up making a play on Forkish's FWSY Pain De Campage recipe as it calls for a high starter volume and I wanted to use up what I had made. My plans changed as I had been planing on creating a home brew American Ale beer yesterday AND make some bread and then reality set in. I was chewing off more than I could get done before dinner plans. I had no whole wheat flour in the house which compounded this. I ended up using only bread flour and to make it a bit more interesting found some left over oat bran in the pantry. For the two loaves I added 10 ounces (from a measuring cup - I should have weighted it I know) and 10 ounces (by weight) of very hot water to create a soaker while I did autolyse. I decided on 10 ounces of bran as that's all I had left in the bag. It was clumpy when wet so I it really required a lot of effort to break it down and incorporate into the dough. I did three or four folds, used a proofer at 77 degrees and by the time I was home after dinner the dough had more than doubled. The recipe called for 2 grams of dry yeast which I added to help the rise given the bran. I baked this morning - so about 12 hours later - and clearly the dough was pushing the envelope of fermentation time. I baked in a combo cooker and achieved only a very slight rise. But this has to be the softest crumb I've ever baked. 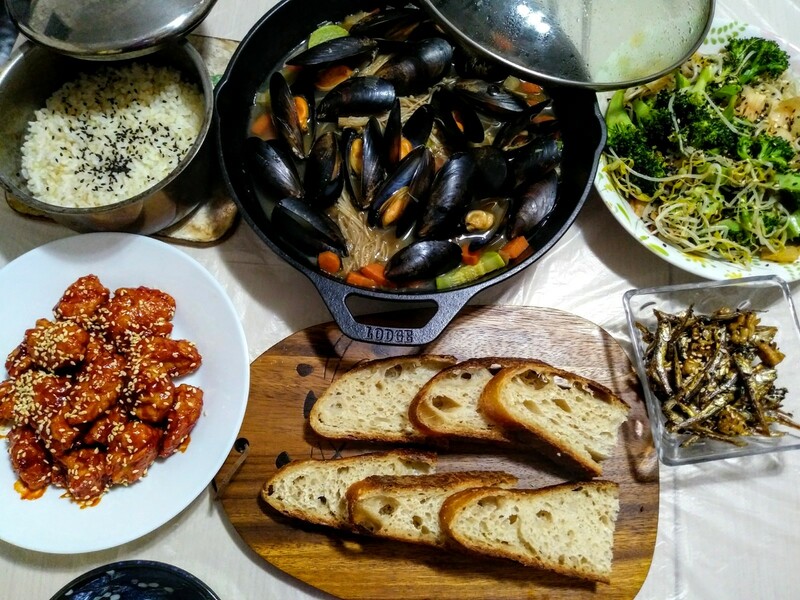 It's moist, lovely and flavourful. Every time I use anything bran in a recipe I'm more of a fan of it's impact on the crumb! 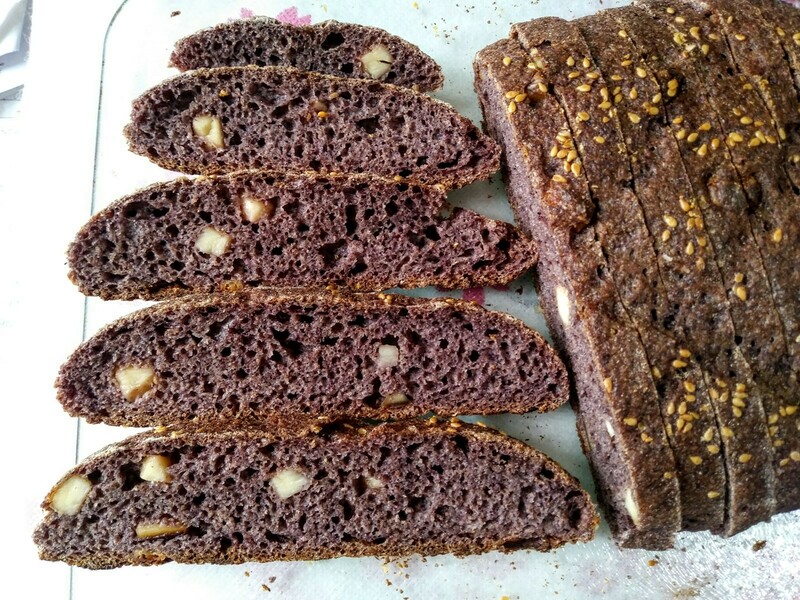 I coated it in dark flax seeds. When I put in my order of grains from Daybreak Mills, I included a bag of Buckwheat. Tartine 3 has a recipe for Toasted Buckwheat Groats with Crème fraîche so I took my inspiration from there. Having a litre of local yogurt in the fridge, I subbed it out for the crème fraîche, used durum wheat and some Buckwheat flour instead of what he called for, and also cut back on hydration. The formula was also adjusted for 3 loaves. Toast the groats for the add-ins in a dry frying pan or the oven, and reserve for the next day. Mill the durum berries and sift to obtain the needed amount of high extraction flour. Save the bran for feeding the levain. Place 400 g of high extraction durum flour in the tub and add the unbleached flour to it as well as the freshly ground flax. Cover and set aside. Reserve the leftover high extraction flour for feeding the Levain in the evening and the next day. Before going to bed, feed the levain 36 g of water and 36 g high extraction durum flour. Let that rest in a warm spot overnight. Early in the morning, feed the levain 72 g of filtered water and 72 g of durum/AP flour and let rise 4-5 hours in a warm spot. Mine doubled in 4 hours but I waited 5 hours because I wanted the autolyse to last a couple of hours. Two hours or so before the levain is ready, put 800 g water in a stand mixer’s bowl and add the flours from the tub. Mix on the lowest speed until all the flour has been hydrated. This takes a couple of minutes. Autolyse for a couple of hours at room temperature. At the same time, soak the toasted groats in hot water for a half hour. They soaked up a lot of water. And I mean a lot! After the time is up, drain well and mix in the yogurt. Once the yogurt was mixed in, I started worrying about hydration thinking maybe I’ll be making soup instead of dough. Cover and set aside until the levain is ready. Once the levain is ready, add the salt, the Buckwheat Groats mixture, and the levain to the bowl. Mix on the lowest speed for a minute to integrate everything, then mix on the next speed up for 5 minutes. Amazingly, the dough pulled together nicely and didn’t turn into soup! Do 4 sets of stretches and folds at 30 minute intervals, then do two more sets on hourly intervals. Note that the dough was very loose initially , but I just kept folding during the first set until the dough pulled together and I couldn’t do another fold. The dough felt great for the remaking sets. After the last fold, which I did 20 minutes early because the dough seemed to be rising fairly quickly, place the dough in the fridge for 4 hours. The dough rose 50-60%. Tip the dough out on a bare counter, sprinkle the top with flour and divide into portions of ~885 g. Round out the portions into rounds with a dough scraper and let rest 45-60 minutes on the counter. The oven spring could have been a tad better especially when I increased the amount of flour compared to my usual base amount. I guess all that water that the groats absorbed had a bit of a negative effect. Next time, I need to add just enough water to cover the Groats and not add extra when it gets absorbed. One thing I am noticing since we have been getting warmer weather (barely above 0C (32F) but better than -20C! 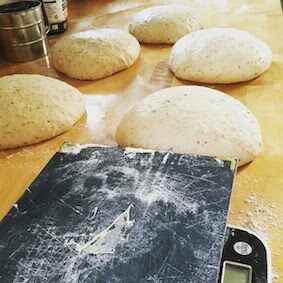 ), is that my dough seems to be moving a lot faster than in the depths of winter even though it is the same temperature in the house. I even bulked this one in the counter to try to slow it down. Anyone else notice that the seasons affect bulk and proofing even though it’s the same room temperature? Sift out the bran from dough flour, reserve 36 g for the leaven. Soak the rest, if any, in equal amount of water taken from dough ingredients. Combine all leaven ingredients and let sit until doubled, around 5 hours (27°C). Roughly combine all dough ingredients and ferment for 1 hours 50 minutes. Construct 1 set of stretch and fold at the 15 minutes mark and fold in the cheese at the 30 minutes mark. Preshape the dough and let it rest for 10 minutes. Shape the dough, sprinkle some toasted white sesame on top, then put in into a banneton. Retard for 19 hours. My apologies for the repetition: you really never have to worry about getting a close crumb with spelt :) It’s just so reliable for opening the crumb up and don’t forget we’re talking about whole spelt here! Despite being over-proofed, the crumb isn’t entirely bad. If you like rice, I guarantee you’d like this bread. 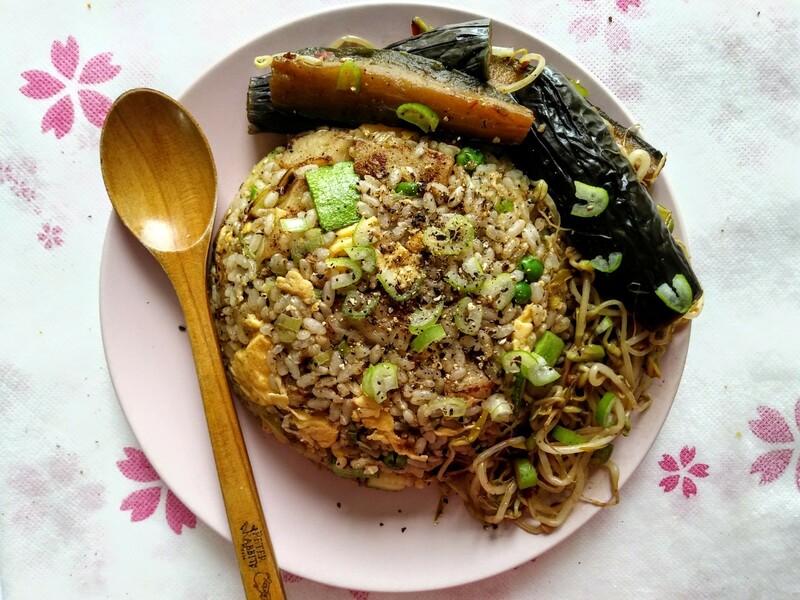 It’s the pronounced fragrance of rice, with the added sweetness and unique aroma of purple rice and germinated red rice. 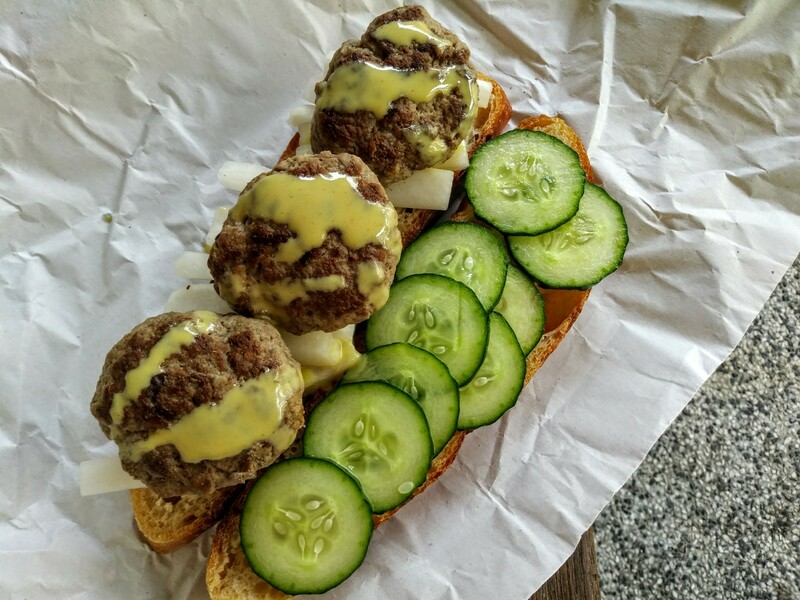 The smoked Gouda contributes a savory component which I always enjoy in sweet spelt bread like this. Next time...Next time we shall see an ear! The autolyse, including putting in 50ml of water with 20g, turns my dough into spaghetti and I don't think it ever recovers. No problems with the bulk fermentation though it doesn't seem to rise like they expected. I am sorry. I like dusting flour. I like throwing it, rubbing it on the counter, and dusting the lovely pillow loaf. I do not like stinging the flour to preserve a massive amount of hydration (what the hell is it in this recipe, 75%?????). It sticks it barely forms. Nope not my dough. Worst of all when it comes out of the banneton. Usually this loaf falls flat as a pancake. Very disturbing indeed. Luckily it comes out pretty good, no oven burst like I discovered with the 1-2-3 loaf but not bad. And good holes inside, but again, too much work for big holes. I don't like big holes, the spreading butter falls right through them. It is really a shame that my wife says that this is her favorite kind of bread. We had a wonderful breakfast of nothing but bread, which made us all quite late. I admit, with a rye NMNF starter, the rye seems to really come through. So I got three different kinds of flour in this loaf. 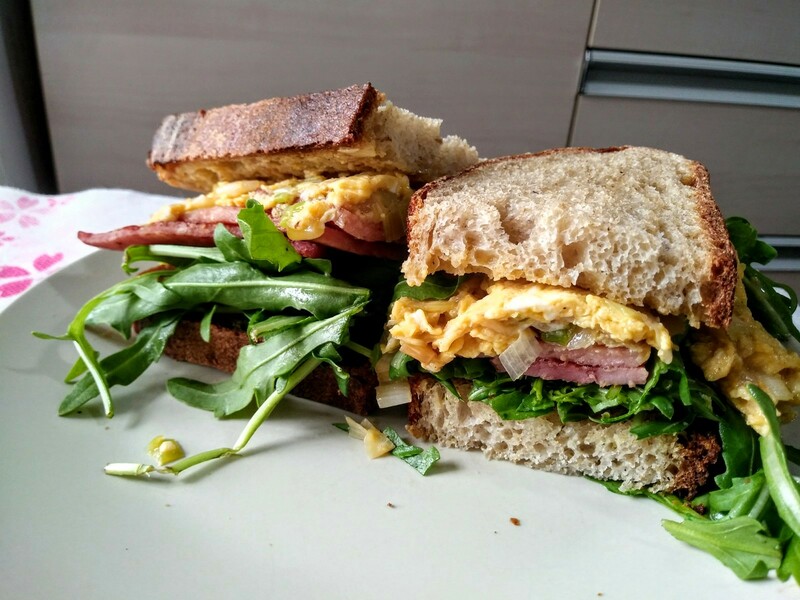 Anyone else got problems with the infamous/ famous tartine? Next time no autolyse AND throwing the flour all over the place! 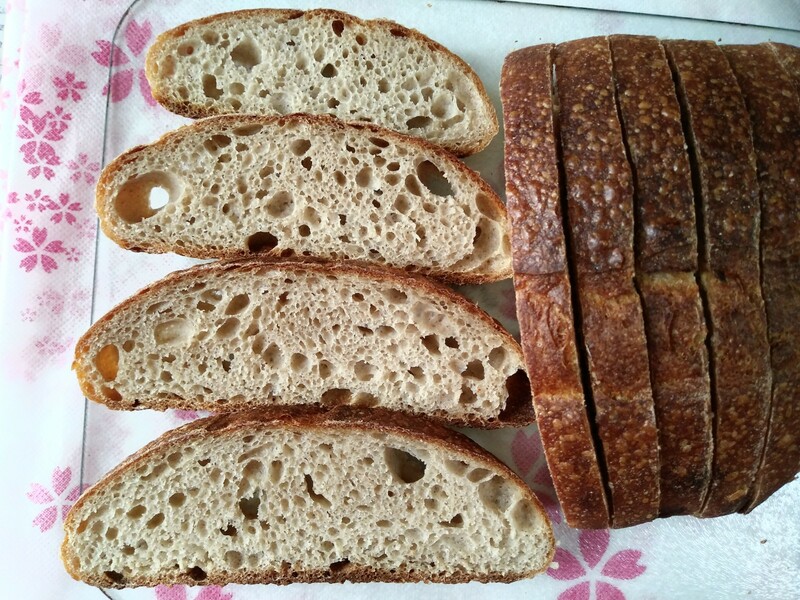 I saw a Semolina Sesame loaf in Tartine 1 and another sesame seed loaf in Tartine 3. 80% water, 2% salt, 15% roasted sesame seeds and more seeds for outside..
Pre-shape, 30 min bench rest, and final fold via cinching and room temp proofing in bannetons for 30 min before going into 4C wine cooler for 14 hours. I held a small test loaf back.... 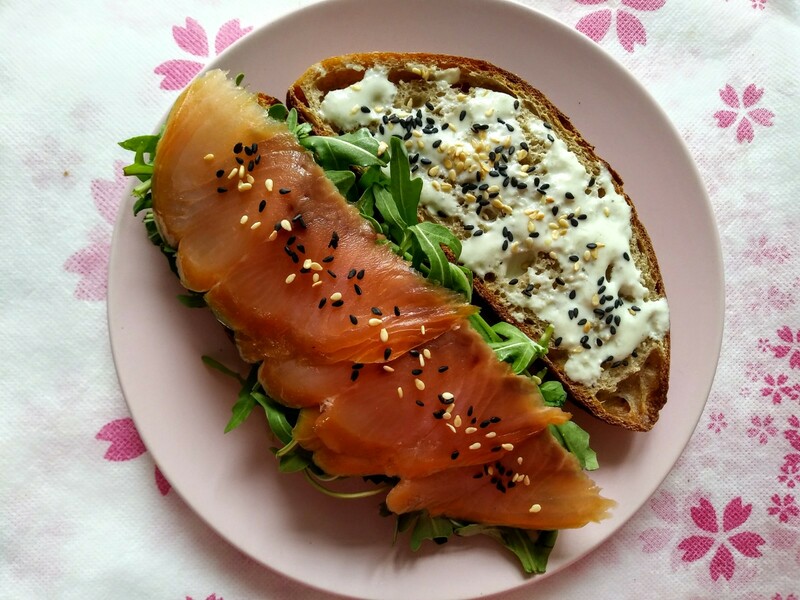 It had a lovely sandwich crumb but the best was just the taste with all those sesame seeds! But overall very, very happy with this bake! Read more about Semolina Sesame with Khorasan.. I want to design my own bread lame to solve my issues I have with the current lames on the market.. Anyone have any suggestions on improvements to the current available lames on the market?? My current issue is the handle being so short, so I feel like it's child size haha. I'd like a longer more sturdy handle. After last weeks bake my wife said she wanted a bread like that one but in the shape of a loaf, but not in a Pullman pan, so the crumb would be a bit more open. Well. Lucy said we would bale it in the Pullman pan without the lid. Them my daughter said she wanted two loaves to take to people at work. 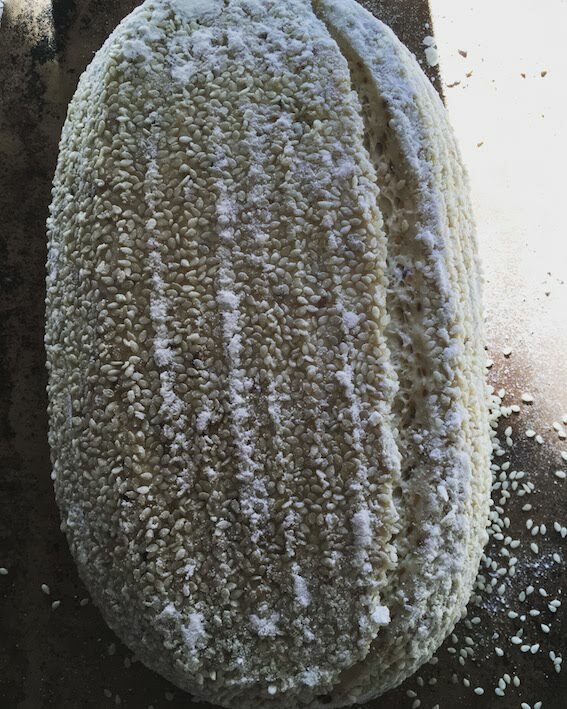 Originally when needed 3 half loaves and we would keep one half of one at home but as soon as the word got out at work that Lucy’s sprouted SD bread was coming to work she needed pieces for 8 people so each would get a quarter of a loaf instead. The wife’s bread was coming along nicely and we were waiting for it to sit for 20 minutes before shaping and then a 10 hour retard after 3 sets of slap and folds and 3 sets of stretch and folds all on 30 minute intervals. But Lucy being as old as she is, fell asleep leaving the dough on the counter under the stainless-steel mixing bowl all night. My wife likes it thin and this bread slices thin. When I wok up at 5 AM she was looking at me sheepishly so out to the kitchen I went and the dough had expanded so much it filled the entire bowl and lifted it off the counter by and inch with dough oozing out all around like it was planned. The part sticking out was very hard, so I cut it off with a knife and quickly shaped the rest of the dough and plopped it into the bottom of the Pullman pan and put it into a plastic grocery bag for another proof. It sad there for 3 hours and only rose 25% - Oh my – so much for a more open crumb. It was still 2 inches from the rim of the tall Pullman pan. I slid the lid on thinking it was too pooped to pop but when the lid came off, 18 minutes later at 450 F, the top of the bread had stuck to the lid! I finally got the lid to slid off and the top of the bread came with it. So, I peeled the stuck part off and stuck it back on the bred and let it continue baking at 425 F convection until it read 207 F.
What is not to like about home made chicken noodle veggie soup with Chinese noodles? Yeah, the top of the bread looked a but wonky but the crumb was open and the flavor of this bread was terrific. It is the best tasting SFSD style recipe when it comes for sour for sure. This one was 15 whole rye, red and white wheat and 10% sprouted spelt and sprouted Khorasan pretty much like the last loaf that tasted great but this one tasted superb. Something abut a really long way over fermented dough that turned out not to be over fermented all that much. 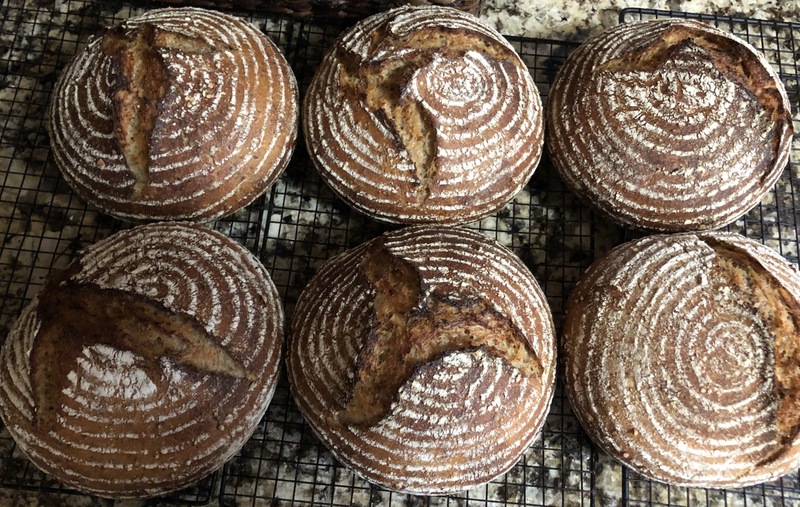 The boule and squat oval for my daughter was the same recipe, 10% pre-fermented whole grain , 100@ levain and 78% hydration total but it was not not over fermented on the counter and it was only 2 hours total for proof but it was under proofed. I should have let it go longer but it had proofed 85%. The crumb was not as open but it sure smelled good even though I didn’t get a taste. 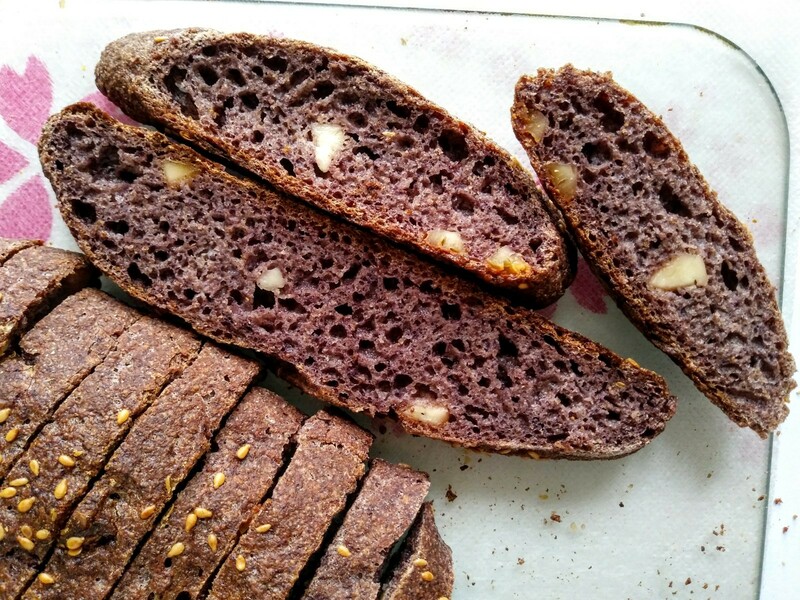 Yippee’s Latvian Black bread is really killer too! Two great tasting breads this week, one white and one black, makes it a special break week for sure. An Lucy says never forget the salad! I recently bought a 25 lb bag of whole spelt berries, and just milled the first of it. For this bread, I used 30% whole spelt, the remainder being Wheat Montana all-purpose. The hydration is somewhere between 75 and 80%. I had to leave the house during the initial rise / folds, so I ended up letting it go for longer than usual before putting it in the fridge to retard overnight. This made the bread slightly more sour than my usual loaves, but it is still quite pleasant. 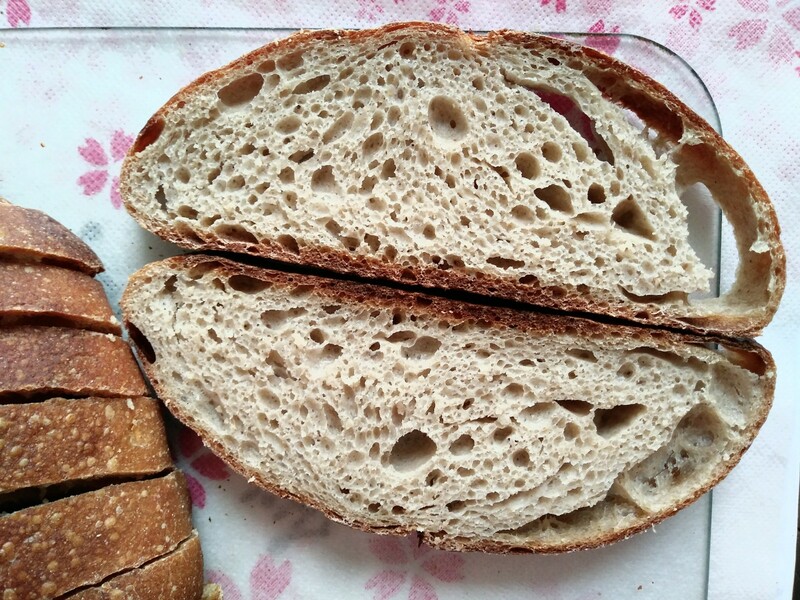 I find that the spelt is very mild tasting, and it was difficult to even detect that the bread was 30% whole grain! I'm thinking of upping it to 50% whole spelt for the next loaf, or maybe 40% whole spelt, 10% whole rye, or something like that. 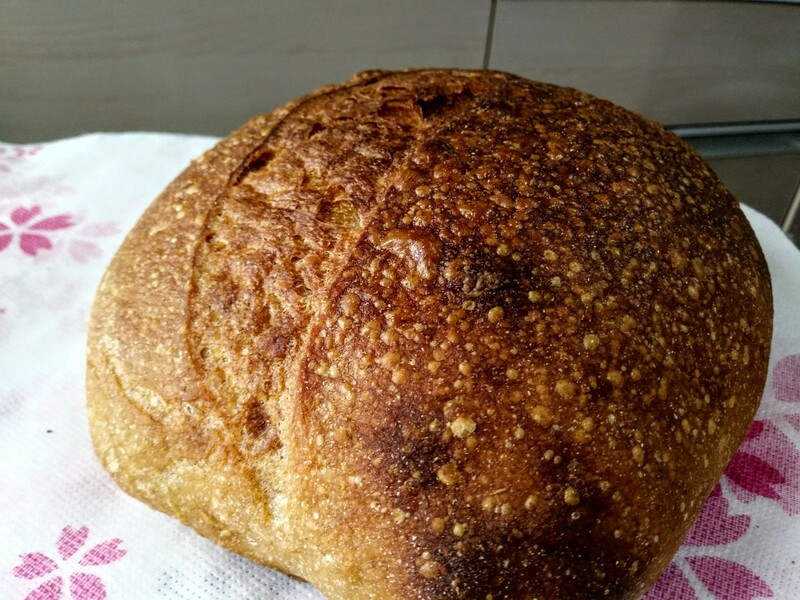 So, i've been baking sourdough bread for about a year now. I love using a blend of various whole grain flours, in this picture, I've done a blend of whole wheat, sorghum and AP with a Rye Starter! I usually get decent crumbs when I add a little commercial yeast into my dough to help it rise, however, I don't get a strong crumb (or at least i think so) without adding a little commercial yeast. I live in India and the sourdough bread scene is still upcoming but slowly. Was hoping for a few tips! I'm not sure why i'm unable to get the bigger 'holes' in my bread. 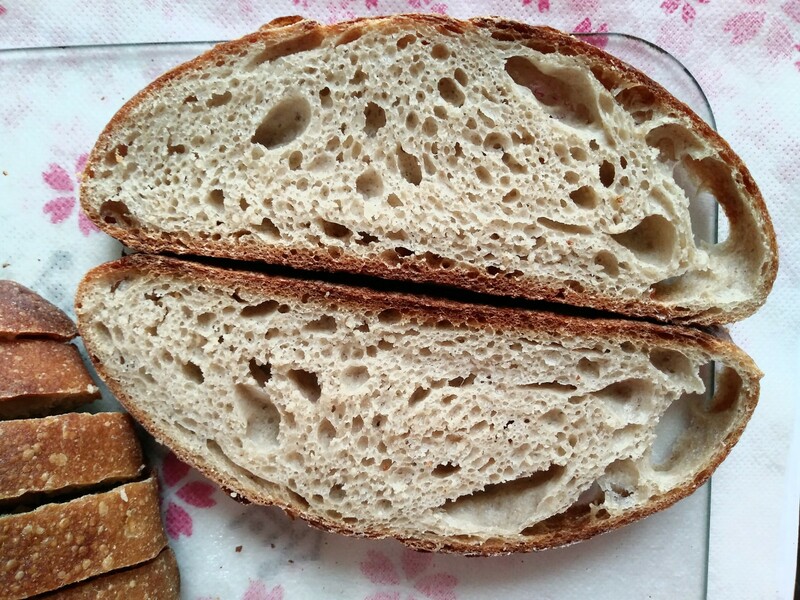 Read more about Sourdough crumb. 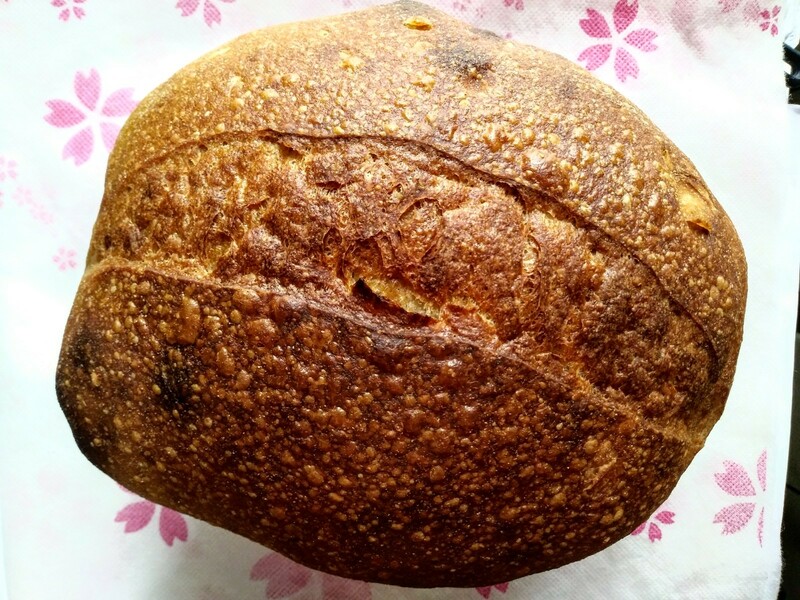 I loved this bread so much that I decided to follow David's version, but substituted the whole wheat with white Kamut. I let it bulk ferment for 9 hours, put it in the fridge for 15 1/2 hours. All in all it came out even better than I expected! It has a lovely golden color from the Kamut and a nice bit of tang. The crust is wonderful. I love the flavor of Kamut and this recipe. Thanks David!